4-Word Review: Insomniac gets into espionage. Ed Okin (Jeff Goldblum) is an insomniac, who has a boring job and an unfaithful wife and is unexpectedly thrown into espionage and intrigue when a beautiful jewel smuggler named Diana (Michelle Pfeiffer) literally lands on his car in the middle of the night while he is out taking a drive. If you are expecting the surreal, cult-like comedy of Martin Scorsese’s After Hours then you can forget it. This thing actually tries to play it straight and does it in a low key way that makes for a lot of slow stretches intermingled with some slight comedy and action. It’s a pedestrian caper with some ‘novelties’ thrown into to try to get you to forget how pedestrian it really is. The novelties are director John Landis’s casting fellow directors in cameo roles. Sure it’s nice to put faces to names, but the cameos really aren’t that interesting or funny. Only French director Roger Vadim gets anything remotely flashy. In fact it’s Landis who gets the best part casting himself as a crazed gunman with a large scar on the side of his face. Goldblum is a solid everyman, but he underplays it and eventual becomes too dull. He doesn’t even react when a loaded gun is put into his mouth!! Pfeiffer is beautiful, but there really isn’t any chemistry between the two so having them end up ‘falling in love’ shows just how contrived this whole thing is. David Bowie and Dan Aykroyd have very little screen time and are badly wasted. This entry was posted in 80's Movies, Action/Adventure, Drama, Romance, Spy/Espionage and tagged Entertainment, Jeff Goldblum, John Landis, Michelle Pfeiffer, Movies, Review, Roger Vadim. Bookmark the permalink. Great movie. 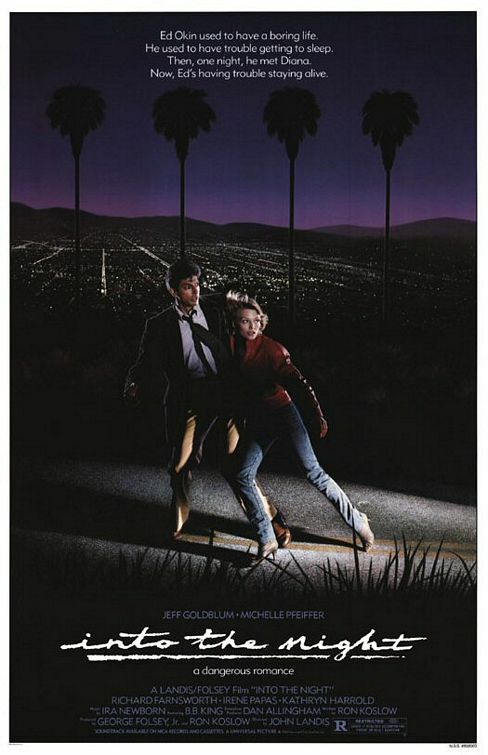 What many overlook is that it is really a homage to nighttime Los Angeles by John Landis, if you happen to have lived in LA during the 80’s you’ll probably see a lot more than 4 out of 10 with this one. Very unique film and very creative. This is better than After Hours. I love this movie, and have for years. But my god Pfeiffer is gorgeous in this; I’d almost forgotten!